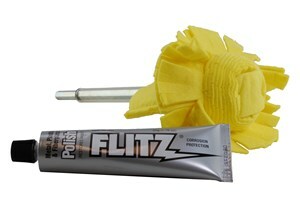 Get professional results quickly and easily with the Flitz 2" Super Mini BuffBall. The patented 8" shaft, with no scratch sleeve, extends your reach and lets you get into tight areas. Great for use on mag wheels, spoked wheels, motorcycle hardware, hot rod and cycle engine pipes and so much more. Use it to buff and polish all metal and painted surfaces. The Ball can be machine washed and reused up to 10 times. The Buff Ball fits on a standard 3/8" drill (not included) for easy of use. Rated for speeds up to 2000 rpm, the felt Buffer Balls polish in record time and won't scorch or burn. This premium buff ball won't tear like foam buffers when hitting sharp edges. No exposed ball hardware to scratch surfaces. Made of soft Italian viscose fiber. Will not shed lint. The 2" Super-Mini Flitz Buff Ball is a real time-saver. 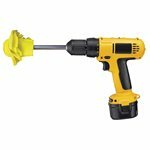 Mount the 2" Super-Mini Buff Ball on an electric drill as shown above. Use it on painted surfaces, metals, fiberglass, plexiglass, aluminum, brass and much more. Great for polishing and restoring aluminum running boards, mag wheels, railings, motorcycles, antiques, furniture, awnings, shower enclosures, patio furniture, and more.